The other night, I was watching reruns of a television series that I find particularly funny, "The Office." In the show's final episode, one of the characters--Andy Bernard--ruefully says, "I wish there was a way to know you're in the good old days before you've actually left them." Andy regrets that oftentimes we don't realize just how good things are until those things have passed away. I don't feel the way that Andy did. I think one of the joys of living the Catholic life is knowing that you are living the "good old days." In fact, what makes the Catholic Faith attractive to others is when Catholics live with an awareness that they are living something extraordinary together. They are living in Christ and Christ is living in them. Evangelization doesn't happen because we say the word "evangelization" enough times. 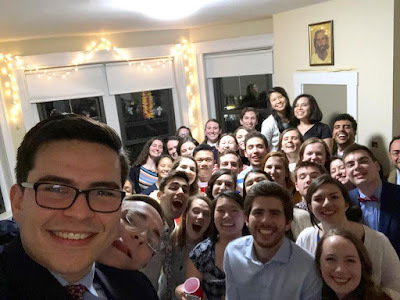 Evangelization happens because we are living something extraordinary together and this moves us to share the joy of this experience with others. Evangelization happens because we ourselves are moved by the awareness that we are part of something extraordinary. In my life as a priest, I constantly feel like I'm in "the good old days." As a parish priest, I knew I was in the good old days when I was sitting at the home of parishioners for dinner, leading the Corpus Christi Procession, or sitting at Finance Committee meetings. When our rectory was filled with priests and seminarians, I knew we were in the good old days. Every day, I knew that we were living something extraordinary together. We were living something that was given to us, not something that we created. We all knew that we were living in that moment, "the good old days." As a college chaplain, I know that I'm living in "the good old days." I know it in the morning time when I sit and have coffee with our staff and with the students. I know it when we hang out and do crossword puzzles together. I know it when I sit on the bench outside of the chapel and hear confessions. I know it when, on a day off, I have Mass with one of our seminarians. I know it when I see students bring their friends to be baptized at Easter. I know it when I hear students give witness talks at retreats. I know it when we joke with one another, pray with one another, and worship with one another. I know it when we go out for lunch together. I know it when students share with me that they are considering a call to the priesthood or the religious life. I know it. I know that we are in the good old days. I'm grateful that the Lord has given me this gift, the gift of knowing that I'm in the good old days at the very moment that I'm in them. And I'm grateful that this gift is something a community shares together. It's a shared amazement. This has been my experience of parish life and of college chaplaincy. I feel like we all stand together in wonder and awe, asking, "How is this possible?" No matter how much work or skill we might put towards our endeavors, it is not a tower of Babel. It is not our accomplishment. It is something beyond us. Something that carries us and moves us. We can't create the good old days. The good old days is the eternal day of Jesus Christ who is the same yesterday, today, and forever. Do we want to draw others into the Church or back to the Church? Do we want to see priestly and religious vocations flourish? Do we want to see families attending Mass? The answer is found not in our projects and slogans. The answer is found in our being moved by Christ. It is found when a community--priests and people--stand in awe together by what Christ is doing, and realize together that we are in "the good old days." What Is the Kingdom of God Like? Like This.